How to watch The Gates: Season 1 (2010) on Netflix Singapore! Sorry, The Gates: Season 1 is not available on Singaporean Netflix, but you can unlock it right now in Singapore and start watching! With a few simple steps you can change your Netflix region to a country like Argentina and start watching Argentine Netflix, which includes The Gates: Season 1. We'll keep checking Netflix Singapore for The Gates: Season 1, and this page will be updated with any changes. 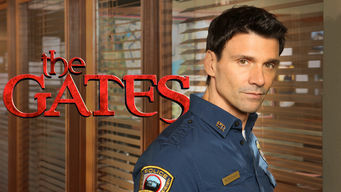 The Gates: Season 1 is not available in Singapore BUT it can be unlocked and viewed! Life in an upscale, gated community is more dramatic than anticipated for a young police chief who must contend with resident werewolves and witches. He thought policing a gated community would be an easy gig. But these monsters make it far more complicated. Season 1 of The Gates has 13 episodes. Because different Netflix countries have different availability for episodes, you'll need to check the episode listing below to see which are available in Singapore. The Monohan family moves into their home in the Gates, an exclusive community with perfectly manicured lawns and decidedly strange neighbors. Nick investigates the death of the last chief of police and is deeply disturbed by the mysteries he is discovering about the Gates. There's a series of mysterious robberies around town, and Brett tries to re-ignite his relationship with Andie, though she is still drawn to Charlie. A missing hunter brings unwanted attention to the pack, while Nick and Dylan try to put their differences aside during a father-daughter dance. No sooner is Nick assailed with the revelation that vampires exist and are living inside the Gates, than he finds himself forced to ally with one. When a neighbor is murdered by a vampire, Nick enlists Dylan to find the killer. Sarah organizes a fundraiser, but finds it hard to achieve harmony. Finding themselves blackmailed by Frank Buckley, Nick and Dylan set out to dig up a secret on him that is equally damning. When Lukas's father is assaulted and left for dead, Nick must diffuse a potential turf war between Vampires and Werewolves. FBI agent Kat Russo arrives at Nick's precinct in search of a criminal, but the deeper Russo digs, the closer she comes to uncovering dark secrets. When a madman kidnaps their daughter, Dylan and Claire enlist Nick, but as the search intensifies, Nick learns the truth about the couple's past. As Nick investigates a grim secret, his past once again comes back to haunt him, and this time the demons are more real than he could fathom. Buckley and Vanessa make a hard decision that threatens to destroy the neighborhood, while Sarah seeks relief after learning about the Supernaturals. After Vanessa and Frank's deaths, the Monohans make plans to move from the Gates, but their plans are interrupted when Charlie runs away with Andie.